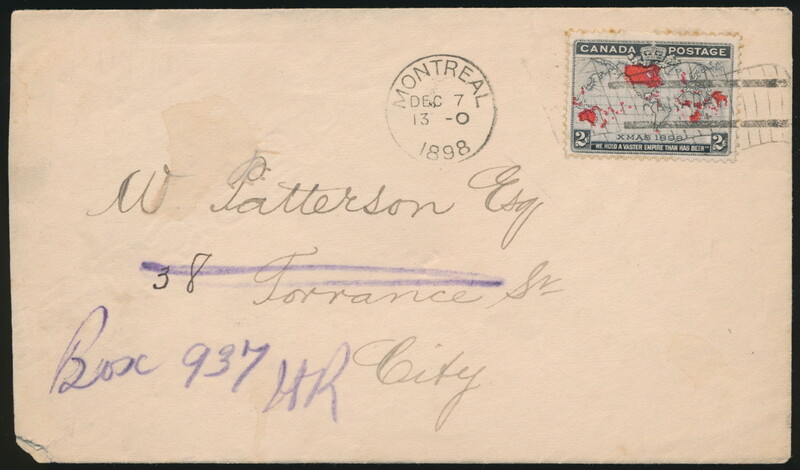 Lot 351 Canada two cent Map Stamp, December 7, 1898 First Day Cover, mailed from Montreal (Bickerdike machine at 1pm) to Montreal, received there at 10pm (Bickerdike hub on back), attempted delivery (DEC.7 carrier marking), address changed to a local post office box in purple crayon and re-despatched (for free) Notre Dame St. West L.C.D. next morning at 7am. Small corner fault bottom left, still a very fine example of this first day of use for the Map stamp in combination with a 2c drop letter rate, with very few known. Rsv. From the Robert Lunn Map Stamp Collection. Estimate C$1,000, sold for $2,400 plus buyer’s premium. 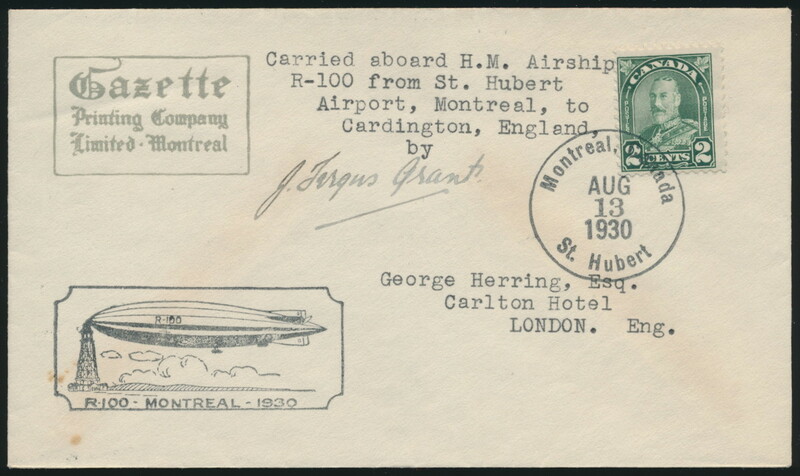 Lot 1145 Canada 1930 R100 Airship Cover Flown from Montreal to Cardington, England. 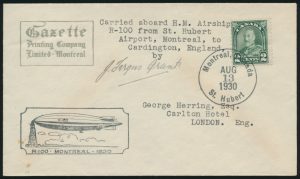 This cover was carried on board the air ship at Montreal by J. Fergus Grant, who was a reporter travelling on the air ship return flight for the Montreal Gazette. 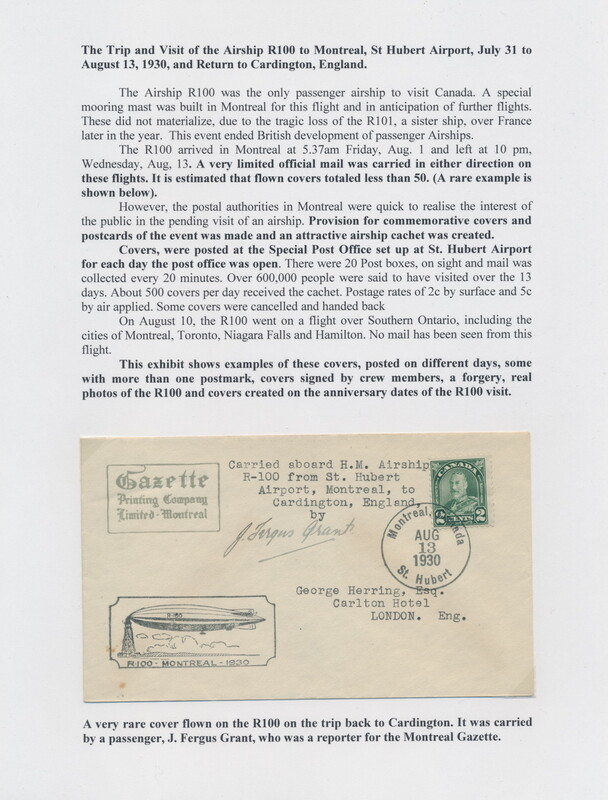 The cover is signed by Grant and has a St Hubert AUG.13.1930 datestamp. A few small tone spots at bottom left, still very fine and rare. No backstamps as it was carried out of the mails. It is estimated that fewer than 50 covers were flown, with many to officials, either in Canada or the UK. Offered on a fully written-up exhibit page. Estimate C$1,500. 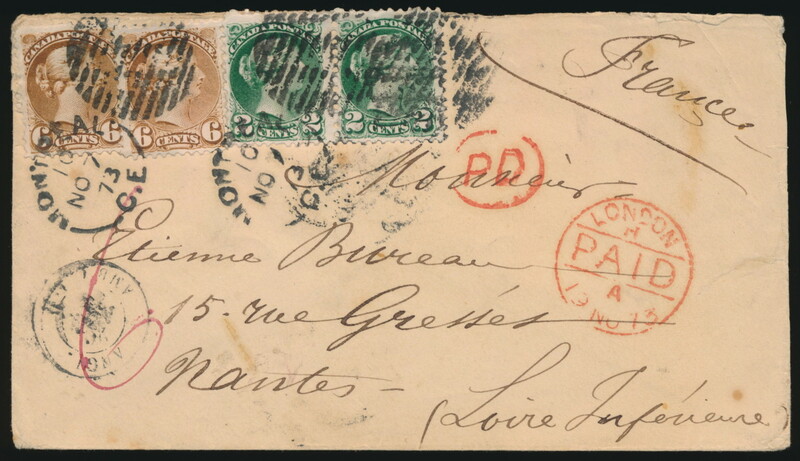 Lot 1025 Canada #5 1862 17c Cartier on cover to Bourges France, mailed from Montreal on JAN.10.1862 (duplex) and addressed to Bourges, France, through London (JAN.25) entered France at Calais (JAN.25), then by train to Bourges (JAN.26 receiver). Carried by the Allan Line Norwegian. 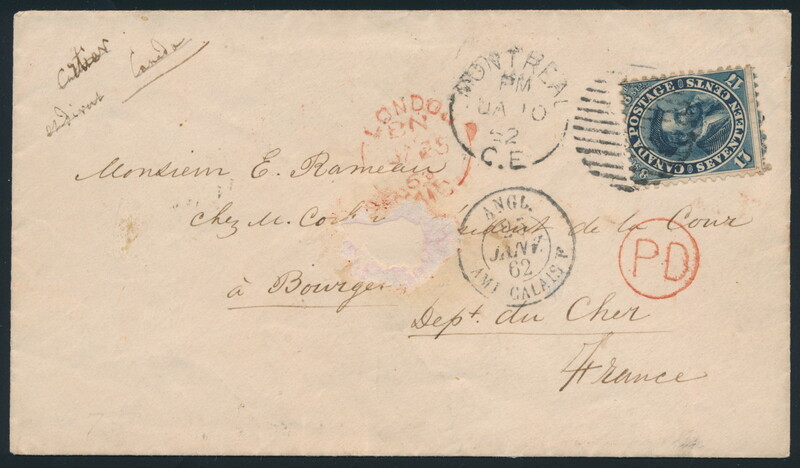 This is interestingly one of the only nine covers franked with the correct 17c rate to France, as listed in Arfken and Leggett’s Canada’s Decimal Era, 1859-1868, even though this rate was in effect from July 1, 1859 to 1870. 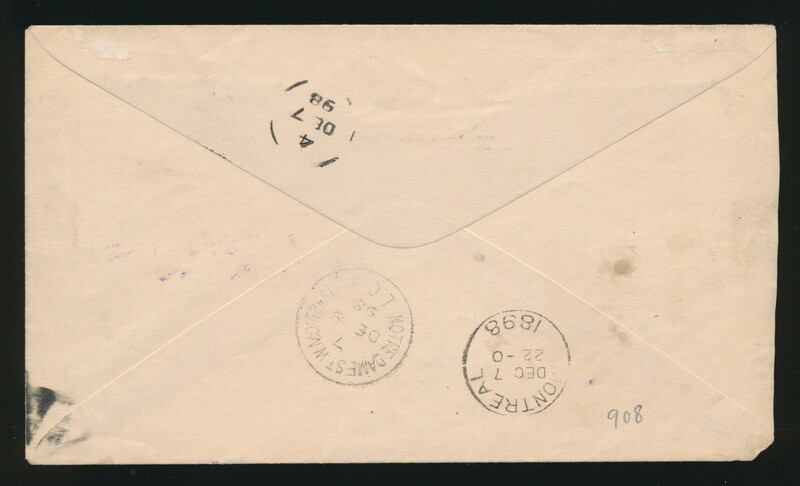 There is a small internal tear in the centre of the front side, still a rare franking and an appealing cover. Valued at $1,000 in Firby’s The Canadian Posted Letter Guide. Estimate $500, sold for C$800.00 plus 15% buyer’s premium. 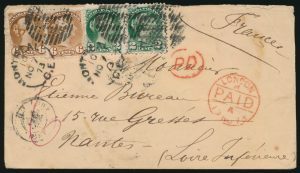 Lot 1030 Canada #10 1873 pre-UPU Double Weight Cover to Nantes France, mailed Montreal on NOV.7.1873, through London (NOV.19), has a “Paris à Bordeaux” datestamp (NOV.20) and then a Nantes receiver (NOV.20). There is a manuscript “6” for the British transit claim. The cover is franked with a pair of 2c and two 6c Small Queens (all perforated 11½ x 12) paying the proper rate for letters over ¼oz and under ½oz. The backflap has a blue oval advertizing for “A. Lechevallier / Naturaliste / Montreal, P.Q.” Carried by the Allan Line Samarian from Québec City to Liverpool. Small tears at right do not detract from this lovely and very fine cover. Provenance: Simpson (1996), Menich (2000). Estimate C$1,250.